The victory was sealed with a hit for four in the fourth end, followed by a steal of two in the fifth for a 7-3 lead. Sweeting/Gushue attempted a comeback with a score of two in the sixth on the power play and stole a point in the seventh. 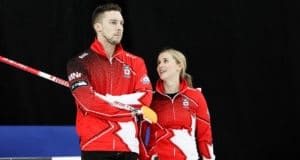 But a Sweeting hit rolled too far in the eighth, which crowned Lawes and Morris as the first team to represent Canada at Pyeongchang in the mixed doubles discipline. Lawes will be going to the Olympic Winter Games for the second time in a row. In 2014, she won gold as third for Jennifer Jones. In 2013, she and her team won the Tim Hortons Roar of the Rings in front of a home crowd in Winnipeg to qualify for the Olympics; four years later, she once again had the honour of earning the right to play for Canada by winning a Trials event in her home province. Like Lawes, Morris is an Olympic gold-medallist, having won in 2010 at Vancouver playing third for Kevin Martin. After his four-player team fell short at the 2017 Tim Hortons Roar of the Rings, he set his sights on Portage la Prairie. “It feels fantastic. It was a tough year to be honest with you. You have your sights set on winning those team trials, that was our main goal going into this year, but now with this new discipline, it’s such a wonderful new discipline for our sport,” said Morris about the second chance. But he needed to make a last minute lineup change. His regular mixed doubles partner, Rachel Homan, won the Tim Hortons Roar of the Rings and wasn’t eligible to play in Portage la Prairie. That’s when he called on Lawes. “I got really lucky that Kaitlyn was available and I knew we’d make a great combo. I’ve always felt our dynamics were really good, we’re good friends and she’s just a heck of a shot maker. I felt that we’d have a pretty good chance here. It took us a bit of time to gel, but by the end of this week we were really finding our groove,” Morris said. Sweeting and Gushue defeated Lawes and Morris twice at the event. But they didn’t have enough in the tank to defeat them a third time. They took a 3-1 lead heading into the fourth, before the tides turned. After Gushue threw a guard, Morris made a hit-and-roll to sit three in the back button and four-foot. Sweeting attempted to lock one onto the button, but her freeze attempt was heavy, setting up a Lawes hit and roll for four and a 5-3 lead at the fourth end break. But Sweeting thought Gushue’s assessment of the end was too harsh. Lawes and Morris controlled the front of the house in the fifth end. By Sweeting/Gushue’s final shot, they sat two on the front of the button. Sweeting and Gushue elected to play a runback to score, but it was wide and resulted in a steal of two and 7-3 lead. 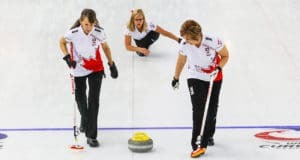 The pair went on the power play to score two in the sixth and trail 7-5 and even tacked on a steal in the seventh after a well-placed draw from Sweeting. But Lawes/Morris went on the power play in the eighth and didn’t need to throw their last rock for the win. Sweeting and Gushue rolled too far on their final hit, which provided Lawes and Morris with shot stone and a new, unprecedented accolade: two-time Canadian curling Olympians. Mixed doubles curling at the Olympics begins on Feb. 8 — a day before the Opening Ceremonies. 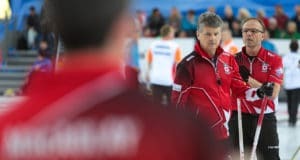 You can check out Canada’s schedules for mixed doubles, men’s and women’s curling by CLICKING HERE.